This section is to the left of the entrance arch. 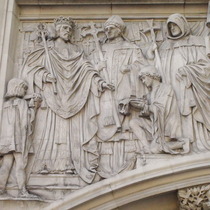 The description of "Henry III granting charter to Westminster Abbey" is ubiquitous on the web but we cannot discover what that charter was or its date. 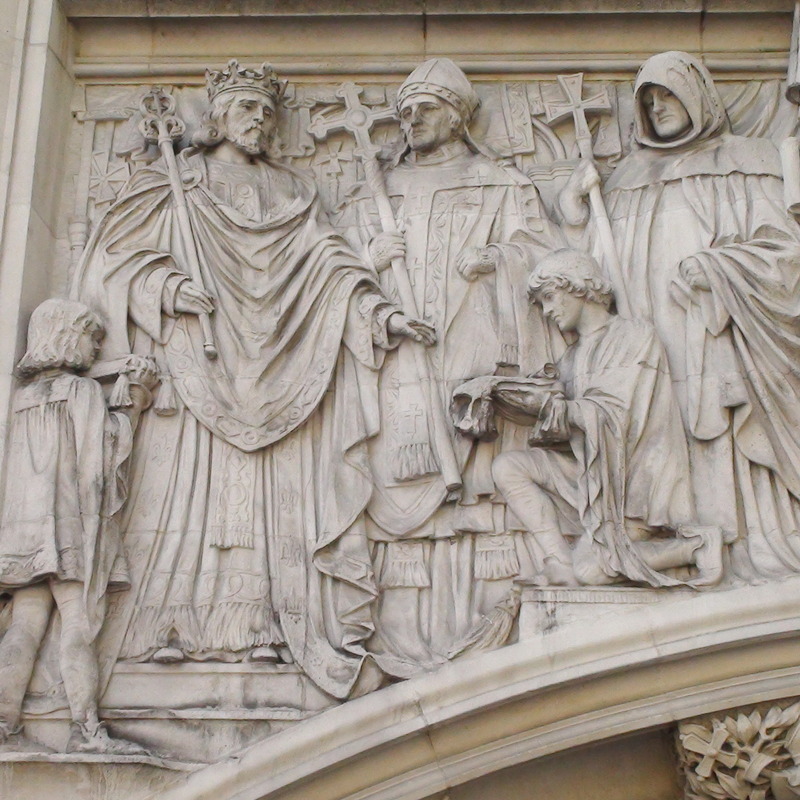 At Knight Order we find that Henry granted a number of charters to Westminster Abbey, and there does not appear to be any one particularly important one. To the right there is another kneeling page presenting a near-identical bishop with a flask on a cushion. None of the sources that we have found explain this right-hand section. Possibly it was part of the ceremony of the granting of a charter. At one time this was the site of nearby Westminster Abbey's Sanctuary Tower and Belfry. This building was designed by James S. Gibson and Partners and built 1906-1913, in what Pevsner described as art nouveau Gothic. Originally designed to be the Middlesex Guildhall as offices and to house the quarter sessions, it was converted to a crown court in 1964 and then in 2009 to the Supreme Court. We were puzzled why the Middlesex Guildhall should be in Westminster. It's complicated but here goes ... All of London, with the exception of the City of London, was part of Middlesex until 1889 when the County of London was formed. The building on this site at that time was effectively the Westminster Guildhall. And there was a building in Clerkenwell, the Middlesex Sessions House. The two buildings were "swapped" so that the one in Westminster could be used by Middlesex and the one in Clerkenwell could be used by London. This may not be the whole story but we think that is the gist of it. Ornamental Passions gives an excellent description of the whole frieze with large pictures. Waymarking also has some good photos.